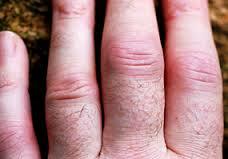 Rheumatoid arthritis (RA) is a condition that presents with the pain and swelling of the joints. In more complex words it involves the painful swelling of the inside lining of the joints, called synovium. Left untreated it can cause damage and destruction of the joint. The cause of the RA is unknown. There are many factors that can play role in it. The important factors are genetic predisposition (presence of special genes), gender and some environmental triggers. It is more common in women. Examples of other proposed triggers are smoking, infections and stress. 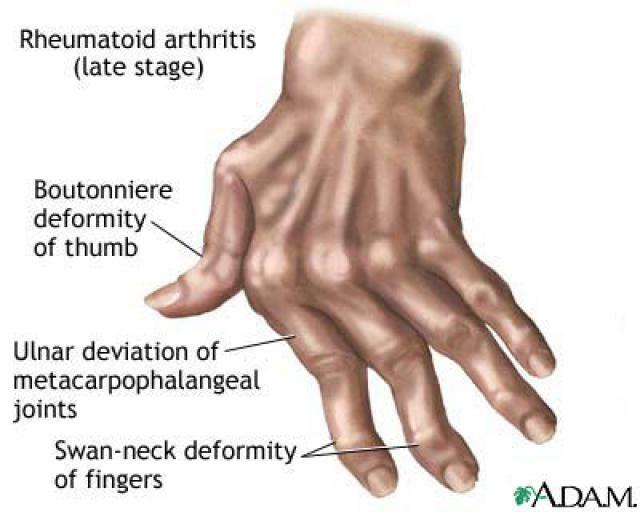 In most people, rheumatoid arthritis begins gradually, and weeks or months can pass before person seeks medical care. Early symptoms may include fatigue, muscle pain, low-grade fever, weight loss, and tingling in the hands. Joint symptoms include pain, stiffness (usually in the morning or after prolong rest), redness, warmth, and swelling. Rheumatoid arthritis typically affects small joints, especially the joints at the base of the fingers (MCPs), the joints in the middle of the fingers (PIPs), and the joints at the base of the toes (MTPs). It may also begin in a single, large joint or it may come and go and move from one joint to another. Some people with rheumatoid arthritis develop carpal tunnel syndrome because swelling compresses a nerve that runs through the wrist; this syndrome is characterized by weakness, tingling, and numbness of the hand. The pictures on this page show typical rheumatoid deformities but they are less common now with the initiation of early treatment. Rheumatoid nodules are painless lumps that appear beneath the skin. They most often occur on the forearm and on the elbow, but they can also occur on other pressure points, including the back of the head, the Achilles tendon, and the tendons of the hand. RA is diagnosed based on the presentation, blood tests and changes on the XRs and ultrasound of the joints. Blood work abnormalities are helpful to make a diagnosis. Some of the tests (low hemoglobin or high markers of inflammation, so called ESR and CRP) point to the presence and severity of the disease. There are two blood tests, so called rheumatoid factor and anti-CCP antibodies, that can help to confirm the diagnosis of RA. Anti-CCP test is the new test and if positive can be seen almost only in rheumatoid arthritis. Rheumatoid factor can be positive while tested in other conditions. Sometimes, patients with rheumatoid arthritis are positive for tests of other connective tissue diseases such as ANA, anti-dsDNA or ENA. If rheumatoid arthritis patients have dryness in the mouth and in the eyes they can have positivity to anti-SSA and anti-SSB antibodies. Your rheumatologist would perform radiograms or joint ultrasound to make sure that you have not developed a damage to your joints. Often radiographs have to be repeated every 1 or 2 years to make sure that the treatment is adequate. Rheumatoid arthritis has a variable course: it can go away, fluctuate, or worsen steadily. In most people with rheumatoid arthritis, the severity of symptoms fluctuates for weeks or months. It is impossible to predict how arthritis will behave. It is noticed although that patients who have positive anti-CCP test might be prone to more severe disease. The presence of those antibodies and smoking is considered as a negative factor as well. Treatment with drugs, especially when started early, is effective in reducing symptoms, preventing damage, and improving the quality of life. In a minority, the disease may remit completely, although remission is rare without continuing taking medications. In some people, rheumatoid arthritis may be resistant to the treatment. The increasing number of drugs available makes it possible to control it. Remission in pregnancy is common, although more than 90% of women have a flare of arthritis symptoms within 3-4 months after childbirth. Rheumatoid arthritis is treated with so called DMARDs, disease modifying anti-rheumatic drugs (look under “Medications”). Most commonly used drugs are methotrexate, leflunomide, sulfasalazine and plaquenil. Often, those medications are used together. The are also so called biologic DMARDs. They can be used when regular drugs are failed or contraindicated. More information can be found under “Useful links” and “Medical news”.